When I was younger and lived near a number of natural and whole food markets I took for granted how easy it was for me to find unusual or seasonal ingredients year round. Now that I live in a region that is limited in availability for many ingredients, I have learned to make many items from scratch and freeze for later use. Canned pumpkin is one ingredient that is nearly impossible to find in my area unless it's around Thanksgiving. I'm not talking about the pre-seasoned pie filling, but rather plain pureed pumpkin to use in pancakes, muffins and other baked goods (and yummy pumpkin soup). 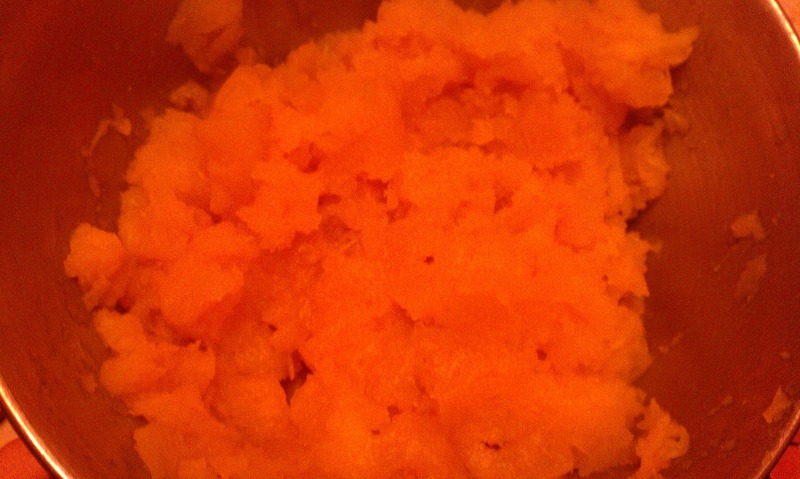 In order to enjoy pumpkin year round I have taken to cooking, pureeing and freezing pumpkin when it's in season. Here is the quick (and inexpensive) way that I make Homemade Pumpkin Puree. The first step is to buy a quality pie pumpkin. I purchased my pumpkins this year at the farmer's market in Charleston (WV) which had a great selection of pie pumpkins at a much cheaper price then the grocery store. Next cut the pumpkin in half. I use a serrated knife, an non-serrated blade has a much greater chance of slipping and leading to kitchen accidents. Now the fun part, scrape out all the seeds and orange pulp. I use just a regular large kitchen spoon and it works fine. Save the seeds to make roasted pumpkins seeds later (recipe to follow later in the week). I cook my pumpkin in the microwave, it's easy and doesn't create a lot of dishes or mess. So the next step, cut up the pumpkin into chunks that are small enough to fit into a microwave dish with a lid. Depending on the size of your microwave your pieces will be larger or smaller. Now pour in a couple of inches of water into the dish, put on the lid and microwave for 20 to 30 minutes. I normally check my pumpkin after about 10 minutes and continue checking every 10 minutes until it's done. Next step is to remove the pumpkin from the skin. Most of the time the skin will fall right off, and you will end up with cooked pumpkin that looks like the picture below. Now the final step, pureeing. I use my blender, but a hand blender, food processor or hand mixer would also work. 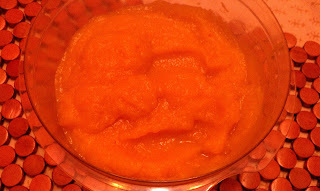 Puree until smooth and it will look something like the picture below. After the puree is done, I place it in freezer bags, remove the air and stick in the freezer for future baking/cooking. It's much cheaper than purchasing at the store and is very easy to make! So the next time your at the farmer's market or grocery store and see pie pumpkins are a good price, don't forget to pick up a few to make into puree and freeze for yummy treats and recipes. Looks great! New follower from MBC. @Chavonne I visited your site, turns out I already follow you :) Have a great day! I love doing this to make pumpkin pies from scratch. @Ott I love making pumpkin pies from scratch also, so much better than store bought! Just a GREAT how to post! You make it sound sooo easy! Thanks for your tutorial! 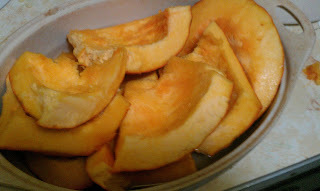 @Melissa I love pumpkin pie :) Visited your blog and followed you back! @Kelly Hope your enjoy your pumpkin puree! Wow! That is awesome. It actually looks pretty easy. I love your tips! I love pumpkin pie soo much and when their season is over, I can only find some weird looking tasteless, odorless pumpkins that are useless. Now I can keep the taste and bake pies all year. Yay! (not my website) To each her own! @Andrea I have a bunch of puree in my freezer right now that I made last week :) I can't wait to make some pumpkin pie or bread! @Carolyn The microwave only takes 20 minutes. I have made it in the oven and the minimum time is around 60-90 minutes. I have two kids and make almost everything from scratch, so for me it makes more sense to use the microwave and save over an hour of prep. The taste is the same whether steamed in the microwave, steamer pot, or oven roasted. I just chose to spotlight the easiest way to prepare, but there are other methods that would take longer, but work also.